One of the ironies of modern life is that we can go anywhere in the world, but we often find ourselves immobilized in the process. There are a number of circumstances that render us immobile: long haul air travel – 4 plus hours (on a bad day, that might be just runway time!). Sitting in a traffic jam or driving to a distant destination. Long hours in front of the computer or TV. Any prolonged period of inactivity places us at risk for Deep Vein Thrombosis – a blood clot that can lead to health complications, even death. The Insider is not sure why people in Great Britain are much more focused on DVT risk than Americans. In England you even can buy specific insurance for DVT. Airlines based in England are contemplating changes in seat design to reduce the risks. The threat of lawsuits might soon result in posted warnings for airline passengers. Some people are more at risk for DVT than others. Here’s a listing of risk factors, a broad net that encompasses most of us. (For more detail on these factors, check out the website). As with any risk, there are a number of ways to respond. Some people move immediately to risk transfer: get someone else to cover the potential loss. That’s where the new insurance policies come in. If you die of DVT within 10 days of air travel, you collect 10,000 pounds. Congratulations!? This insurance is odd for several reasons: the risks are strongest after the 10 day eligibility period ends, so you might succomb from DVT but not collect anything. (Chaulk one up for the insurance actuaries!) In addition, because the insurance only pays for your death, it’s really life insurance. Why bother insuring for just one potential source of your demise when a simple life policy covers you under virtually any circumstances? It’s hard to imagine that DVT insurance is going to be a hot seller. A more attractive alternative to insurance, we think, is the practical advice offered to people locked into a sedentary position: just get your blood circulating. On an airline, get up and move around. If you’re driving in a car, or if you have a window seat on the plane, you can perform “traffic jam aerobics.” If you are adverse to any suggestions of exercise, just make sure you stop and get out of the car for a stretch every two hours. It also helps to drink plenty of water and limit the consumption of alcoholic beverages and caffeine. Shoulder Rolls: To ease the tension of sitting in one position for too long, lift the shoulders up towards the ears, roll the shoulders backwards and then down in as big a circle as you can manage. This will help to release tension in the upper back and neck, so is especially good if driving for long distances in stressful traffic. Shoulder Press: Lift the arms to touch the car roof, take the arms outwards and back down, and repeat. The bottom line is relatively simple. If you find yourself in a situation which severely limits your ability to move around, do something to engage the muscles of your arms and feet. A few simple risk mitigation steps will do the trick. As for the insurance, buy a lottery ticket instead. The likelihood of a payout is about the same. Our thoughts and deepest appreciation to all the military who have given their lives for their country. What more fitting tribute to honor the deceased than to remember the living whose lives will be permanently changed due to combat-related disabilities. There are more than 1 million veterans registered as Disabled American Veterans and, sadly, that number is increasing daily – more than 18,000 have been wounded in Iraq. Today, thanks to better body armor and better medicine, wounded members of the military are surviving injuries that would have been lethal in the past. However, this means that we will be seeing more profoundly disabled vets. 60 Minutes recently reported on the inspirational stories of several of these vets. Others veterans suffer PTSD – wounds that may be less visible to the eye, but that can have tragic results. It’s all well and good to hang yellow ribbons and offer a silent prayer on Memorial Day, but the rubber will meet the road in how we treat our vets on their return over the long term. This will test our national character, and as disabled vets begin returning to the workplace, will test employer resolve as well. On another note, Peter Rousmaniere at Working Immigrants notes that about 6,000 immigrants enroll in the U.S. military each year as a means to citizenship. As of 2003, non-citizens represented 2.6 percent of the military. Many pay a steep price to attain this dream. 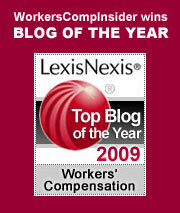 Workplace Prof Blog reports on issues related to veteran re-employment. Veterans have legal obligations to file both departure and return notices to employers to protect re-employment. Unfortunately, there is a lack of clarity about these notices. Craig Crawford, columnist for Congressional Quarterly, has a short and touching Memorial Day tribute video clip posted on his blog. (Sound alert, and you need flash to see the clip). The Insider has followed trial of former Enron CEO Ken Lay with considerable interest. Just as we like to track the memory lapses of CEOs who plagiarize the work of others (did someone say “Raytheon“? ), we are intrigued when one of the most powerful corporate leaders in America claims that he didn’t know what his people were doing. “You just do your thing and tell me about it when you get around to it. Even better, don’t tell me. I don’t want to know.” Yeah, right. Throughout the trial, Lay continued to blame his fall on the Wall Street Journal. Bad press caused a collapse in confidence. The Journal, of course, is famous for its muckraking attacks on corporate giants. One after another, the Fortune 500 fall. The way we react to a news item often depends upon our pre-conceived notions. We all have an innate sense of what is good and just, tasteless and outrageous (although your “outrageous” might be my “humorous”). Our fellow bloggers at “Overlawyered” scan the news for indications that our over-litigious society is out of control, with greedy lawyers in eternal pursuit of the almighty dollar. They are not lacking for material. Sonoma County, Calif., allowed health care caseworker George Alberigi, 52, to interview Medi-Cal clients by phone from his home, by way of accommodating his psychiatric conditions, namely panic disorder and agoraphobia (fear of public places). Then in 2001 he applied for a promotion. The county turned him down on the grounds that the higher-level job required meeting clients in person. Disheartened, Alberigi went on permanent medical disability. Now a jury has awarded him $1.5 million in lost wages and $5 million in other damages including pain and suffering. From this summary, it sounds as if Alberigi used his disability to leverage the system. It does not appear that Alberigi was seeking a promotion. Instead, in 2001 the County transferred him from his long-term position, allegedly for the purpose of enabling him to gain more experience and be promoted. The County, however, did not give Alberigi a choice and made no effort to accommodate his known disabilities. The new position required face-to-face contact. As a result, Alberigi experienced severe anxiety and panic attacks in 2002 and went out on disability. The County sent him to doctors of their choosing for a fitness-for-duty evaluation. These doctors concluded that Alberigi did suffer from panic disorder with agoraphobia and recommended that he be assigned a caseload that did not involve face-to-face contact with clients. Despite these recommendations from their own doctors, the County refused to accommodate Alberigi, claiming for the first time that face-to-face contact with clients was an essential function of the position. Alberigi asked to be returned to his old position. The County refused this request. Hence the lawsuit. Despite his severe disability, Alberigi was able to function as a dedicated and competent employee. He had the respect and support of his coworkers. Management, for reasons unknown, decided to shake up his narrow world and force him out of a nurturing situation. This obviously did not work to anyone’s advantage. The result was a disservice to Alberigi, to his employer and to the taxpayers of Sonoma County. In addition, the story becomes fodder for perpetuation of a particular world view. If you only focus on the jury award, you may well conclude that this case involved a miscarriage of justice: Alberigi (and his attorneys) did not deserve the settlement. Once again, a jury came up with a ridiculous and undeserved award. The reality appears a bit more complicated. The Insider is all for reform of a judicial system that treats pain and suffering like a lottery. On the other hand, managers – people with control over others – need to be held accountable for their actions. Managers need to combine their vision of the work that needs doing with the realities of the people doing it. In this sad tale, management apparently lost sight of its mission, abused its powers and prevented a proven employee from carrying out his job. No doubt about it, they have to pay for these mistakes. Are you feeling wonky this morning? If so, you’re in luck. Hank Stern at InsureBlog is hosting Health Wonk Review #7. Drop by for your biweekly ration of the best-in-class blogging on health policy, infrastructure, insurance, technology, and managed care. Posted in Medical Issues | Comments Off on Are you feeling wonky this morning? I’ve been in Spain over the last few weeks. Any blogging under my name was done in advance since, by design, I had little access to the Web while traveling. I spent much of the weekend online trying to catch up with news – here are some items I found noteworthy. Miner deaths – In the light of 5 more tragic mining deaths and the fact that mining fatalities in the first four months of 2006 have exceeded the total fatalities in all of 2005, Jordan Barab at Confined Space advocates for competence, experience, and integrity over politics and cronyism in making appointments to the mining regulatory oversight authorities. Workplace First-Aid – OSHA issued a Best-Practice Guidelines for Fundamentals of a Workplace First-Aid Program (PDF). Thanks to Workplace Prof Blog for the pointer. M&A activity – Specialty Insurance Blog posts links to news stories indicating that insurer and agent merger and acquisition activity is trending up, and could perhaps even surpass the 2005 record-breaking activity. Scandal watch – Joe Paduda at Managed Care Matters has been keeping track of the latest developments in the Ohio Bureau of Workers Comp Coingate scandal. Since that post, Noe has been seeking a change in venue and the BWC fired KPMG, the firm conducting audits and overseeing “alternative investments” since 1997. Some question the timing of the firing and wonder why the firing didn’t occur earlier since, according to the former chief investment officer (who was fired), KPMG never questioned the rare-coin investments. New health research tool – David Williams at Health Business Blog points us to a new health care search engine called Healia. He spoke to the company’s founder and reports on the potential. It looks like a serious entrant, and worth keeping an eye on. Immigration – Peter Rousmaniere continues to be an authoritative source for all issues related to the immigration issue at Working Immigrants. Among the many recent stories he’s posted, it is interesting to note that undocumented workers are contributing more than $6 billion a year to Social Security, suggesting that 4.5% of the contributors to Social Security today are coming from workers who are not eligible for these benefits. Flexible schedules – Are flexible schedules that accommodate parenting a work practice only available to professionals and not the working class folks who keep the wheels turning? It would appear so, according to a column entitled The Family as a Firing Offense by Ruth Marcus in the Washington Post. Corporate culture – Diane Pfadenhauer at Strategic HR Lawyer reminds employers that the consequences for being unaware of inappropriate workplace behavior can be severe in her post Don’t Think “It Can’t Happen Here”. Company outings should be a time to kick back, relax and enjoy some sun. Well, maybe. Employers need to stay alert to the potential liabilities that linger whenever they host employees at a company-sponsored event. We have blogged the dangers of serving alcohol at company events and the open-ended risks involved in hosting company outings. Now we read of a strange case in New York that may expand company exposures just a little bit further. Where the state was held liable in this situation, it is not difficult to foresee liability for employers under comparable circumstances. You host a picnic at a park. Employees bring their own coolers, beach towels and umbrellas. A wind blows in, wreaks havoc, and someone is hit by a flying umbrella (or a wayward frisbee, or the edge of a kite…). It’s no stretch to assume that employers will be held accountable for any injuries. The injuries may or may not fall under workers comp, depending upon whether the event was truly voluntary (no comp coverage) or employees were expected to show up (likely to be compensable). We are not suggesting that employers forego company sponsored recreation. Team building can be an important part of attracting and retaining good employees. We’re all for fun and games. But employers need to keep an eye on the risk exposures every step of the way. One person’s fun can be another’s torment (see a recent example here). Employers need to remember that any convening of the workforce assumes the employer-employee relationship. Yes, it’s fun to have fun and connect as friends, but ultimately, employers retain a level of responsibility that goes beyond the bonds of friendship. So make your summer plans. Have a good time. But remember: being an employer is similar to being a parent. Your responsibilities never really end. Teen workers: Stay safe this summer! Posted in Safety & Health | Comments Off on Teen workers: Stay safe this summer! State Farm has categorically denied insurance coverage for hundreds of homeowners in the wake of Katrina. The denials are based upon an engineering report developed by Haag Engineering, a Texas company founded in 1924 that specializes in failure and damage assessments. Famed attorney Dickie Scruggs says that the engineering report produced by Haag is “patently biased” because it concludes that Katrina’s storm surge arrived before the wind could do any damage to policy holder homes. Because State Farm policies exclude flood damage, the claims of these 669 homeowners have been denied. Scruggs has already lost one lawsuit when a court found that State Farm’s policy of excluding damage from Katrina’s flood waters are “valid and enforceable.” So if the storm surge indeed destroyed the homes, these homeowners are simply out of luck. If, on the other hand, they can prove that at least some of the damage was caused by the winds that preceded the storm surge, they may be able to collect something. How much they collect will ultimately be determined by the courts. Scruggs also claims in the lawsuit that many of the State Farm adjusters who inspected homes in Katrina’s immediate aftermath told homeowners that wind damaged their houses hours before any water from the Mississippi Sound surged onto land. But State Farm apparently rejected their findings and fired, transferred or reassigned many of the adjusters. Exit Gregory Peck, enter Jack Nicholson. Depositions from current and former claims adjusters will make for interesting reading. A good neighbor helps out, no matter what the circumstances. But that’s not the way insurance works. Any help from an insurance company is contingent upon the language of a specific document. For hundreds of Gulf Coast residents, one thing is clear: their homes have been destroyed. Whether they will be reimbursed for their losses depends on whether the destruction came from wind or water. Good neighbors don’t give a hoot about such distinctions, but insurers certainly do. As young, first-time workers enter your workplace this spring and summer, it’s critical to redouble your efforts to ensure they work safely. Here are ten quick tips for employers, along with some resources for additional information. Know the Law. Review federal, state, and local laws governing young workers, and ensure that your managers know them, too. Check work permits. Make safety cool. Never underestimate a teen’s need to be cool! Remember how enormous peer pressure was for you in your teens? Teens may not think it’s cool to appear dumb by asking questions or wearing protective equipment. Break these barriers down! Keep a sharp eye out. Watch your young workers closely for fatigue – they may not yet have the stamina of your experienced workers. Also watch for any signs of substance abuse and establish a zero tolerance standard. Take a lesson from Madison Avenue. There’s a reason why advertising works – it repeats a message frequently and in different media. Make sure your safety message stays top of mind at all times. Stuff safety tip sheets in your paycheck envelopes, hang signs everywhere, offer small incentives for good safety suggestions. Train, train, train! Don’t forget to make safety a number one priority in any training programs. State the policies and set expectations. Point out hazards, demonstrate things that could go wrong and be explicit. Teens have an illusion of immortality that you need to break through. Buddy up. Pair a new teenage worker with an older more experienced worker for their first few days. Have the “safety mentor” check in on the teen frequently over the first few weeks of work. This will help to spread the responsibility throughout the workforce. Get Mom & Dad involved. Send a letter to your new employees’ parents telling them about your company’s safety policies, and ask for their support in reinforcing the message. Dress for success. Make your under-age workers visible to their co-workers in some readily identifiable way so everyone can look out for them. Give teens different colored name tags, uniforms or caps so that everyone can look out for them. Hold managers responsible. Set your expectations with supervisors and managers, and schedule trainings in laws and issues related to teen workers. Make sure your expectations have teeth – put this important issue in performance reviews! Walk the walk. Owners and senior managers need to set the example and live the commitment. Establish the priority in your organization. Walk through your workplace on unscheduled visits. Talk to teens one-on-one about safety and probe for questions or suggestions. Many teens may not yet be assertive enough to speak up with concerns. Correct hazards or unsafe behaviors immediately. How safe are your favorite kids on their new jobs?